* Please Note: Extended hoods are required for installations where the fireplace surround materials are thicker than one inch. For installation in any White Mountain Hearth standard mantel, use the standard hood and order an outer frame. The Empire VFD42FB2MF Breckenridge Deluxe Vent-Free Firebox is a great addition to any home. With the stainless exterior, it's built to withstand heavy use, but the refractory interior, ceramic brick lining, and slatted louvers are included to make this an efficient and attractive unit as well. 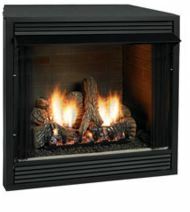 This 42 inch firebox can be used without any vent, making it a great option for tight spaces, and it can be used with most 30 inch vent free log sets, allowing you to easily customize this firebox to meet your personal preferences. Empire Direct also includes a 5 year warranty with this firebox.